It's hard to place value on a limb. What are you supposed to ask for when you're selling an arm? Should you ask more if it's muscley? What if its nails are manicured? Do you get extra for that? Luckily, Gregory at Corpse Corp is here for your limb appraising needs! Call us to your morgue or graveside to take account what you've dug up and we'll tell you what kind of hand you have on your hands. Why just last week we appraised a fine mummified knee for four hundred bucks. Now, we're never sure who's actually in the market for these items but that's why we're a limited liability organization! 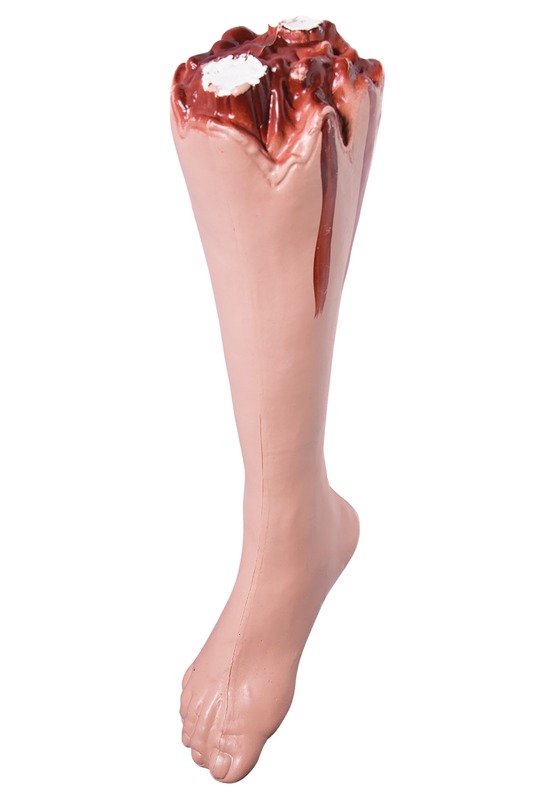 This Value severed leg can serve multiple purposes from Halloween to Halloween. The molded plastic forms an eighteen-inch-long calf for a macabre and bloody Halloween theme. Add it to your zombie costume to add to your flesh-eating appeal. Delight Halloween revelers by serving it on a dinner plate next to the amuse-bouche. Or give it to Fido before your mother-in-law comes over and get the family talking for years to come. It's your value leg, you decide what to do with it. One thing's for certain, it's sure to give you a leg up on your Halloween!